From what I’ve been told, biscuit in UK and the one in the States are different. Actually, we use both words, but I’m not sure the definition of those. February 28 is “Biscuit day” in Japan. Biscuit here means the one in the UK and “cookie” in the states. 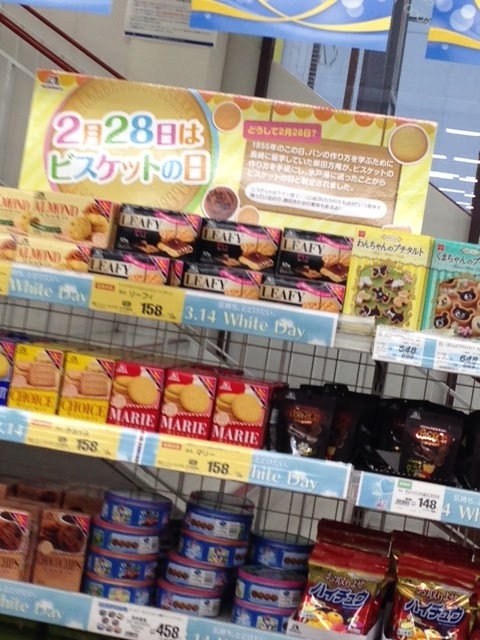 Anyway….I didn’t know that until I went shopping at a supermarket today, ha, ha. According to the Japan biscuit association, a letter mentioned how to make biscuit was written by Shibata Hoan, a doctor, on February 28, 1855. He was interested in the sweets because they were preserved food, having studied its recipe. This is why the association chose this day. As I brought it up, we call the sweets as cookie too. But there is no “Cookie day” as far as I researched. Sorry, cookie! Whatever it is.....speaking of biscuit, I have to have tea, of course!